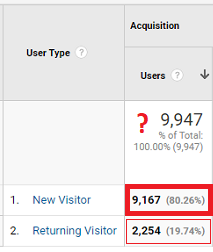 Why do New + Returning Visitors add up to more than the total Users? How can I have more New Users than ‘New Visitor’-type Users? This Misunderstood Metrics article explores the User Type dimension and New Users metric in Google Analytics, and why the numbers can be confusing. What is a New User in Google Analytics? First, let’s clarify how Google Analytics identifies a “New User”: when a visitor views your website, Google’s tracking snippet looks for an existing tracking cookie on the device. If there is no tracking cookie, then Google creates one and considers this a new visitor to your site. A session is started and the User Type dimension is set to “New Visitor”, and the New Users metric is set to 1. If there is an existing tracking cookie on the device, then Google starts a new session with the User Type set to “Returning Visitor” and the New Users metric set to 0. The first problem people encounter is when they add up the number of New Visitors and Returning Visitors, the total does not match the total number of Users. This is because it is common for a single User to visit your site multiple times during the reporting period. They can be BOTH a ‘new’ and a ‘returning’ visitor — new on Monday, but returning on Tuesday and Wednesday. The sum of new and returning visitors is wrong – never add up User numbers for a total. Another confusing thing people sometimes see is that the number of Users with the “New Visitor” type is different from the number of “New Users” in the same report…on the same row. It typically appears with websites with global appeal, and only on multi-day reports. This is caused by a quirk of Google Analytics tracking: at midnight, all active sessions are restarted for the new day. I think this was historically done so the sessions count would be accurate for each day. Sessions are counted only on the first ‘hit’ of the session, so if a session spanned 2 days, it would only be counted on the first day. That would result in page views on the second day with no session, which would mess up a lot of other things, so they just decided to restart the active sessions at midnight thinking that would be a good compromise. The result is a ‘New User’ session on the first day and a ‘New User’ on the second day, but from the same User. When the number of ‘New Users’ is totaled, you would see 2, but the ‘Users’ count would still be 1. Again, the Users number is the right one — the ‘New Users’ contains a few duplicates. This entry was posted in Google Analytics on 2018/08/28 by mike_sullivan.